There are 30 Assisted Living Facilities in the Thornton area, with 5 in Thornton and 25 nearby. The average cost of assisted living in Thornton is $3,330 per month. This is lower than the national median of $3,346. Cheaper nearby regions include Northglenn with an average starting cost of $3,097. To help you with your search, browse the 187 reviews below for assisted living facilities in Thornton. On average, consumers rate assisted living in Thornton 3.9 out of 5 stars. Better rated regions include Northglenn with an average rating of 3.9 out of 5 stars. Caring.com has helped thousands of families find high-quality senior care. To speak with one of our Family Advisors about assisted living options and costs in Thornton, call (855) 863-8283. Just 10 miles northeast from Denver, Thornton, Colorado consistently ranks as a desirable place to live. The population exceeds 136,000, yet less than 9 percent are seniors age 65 and over. In Thornton, the Colorado Department of Public Health and Environment manages the licensing of assisted living facilities of which there are 4 in the city of Thornton and 55 in the surrounding areas. Many are located in central Denver and its suburbs. Arts and culture is a significant focus for the city of Thornton. All kinds of community-based arts facilities are in town, and festivals and gatherings are lined up each year for residents to enjoy. The transportation system in Thornton has seniors in mind with services like Access-A-Ride, A-Lift, and Call-N-Ride. These services deliver seniors to medical appointments, to locations around the city limits, and to cities that are close by the Thornton city limits. So, seniors have plenty of options to get around the area. The cost of living in Thornton is a bit higher than the national average of 100 points, clocking in at 118. Bright spots include the score of 97 for groceries and 97 for transportation. Health care costs sit at 104, and housing is quite high at 155. Thornton's climate can be pleasant, but there are extremes, too. Summers in the Thornton area are a little hot with an average high of 89.2 degrees Fahrenheit in July. The winters are cold and snowy, with an average low in January of 17.5 degrees Fahrenheit and an average snowfall of 45 inches. However, with 245 sunny days per year, the weather can be enjoyable on days with less extreme temperatures. Crime in the city is higher than the national average. Violent crime is 34 percent higher while property crime is 7.6 percent higher. So, seniors may need to take precautions to avoid high crime areas in the city when they go out. Air quality in the greater Denver area is poor, including in Thornton, so seniors with medical conditions may have breathing difficulties when traveling around the city. Denver's grade for air quality is a D, according the American Lung Association. Assisted Living costs in Thornton start around $3,330 per month on average, while the nationwide average cost of assisted living is $4,000 per month, according to the latest figures from Genworth’s Cost of Care Survey. It’s important to note that assisted living rates in Thornton and the surrounding suburbs can vary widely based on factors such as location, the level of care needed, apartment size and the types of amenities offered at each community. 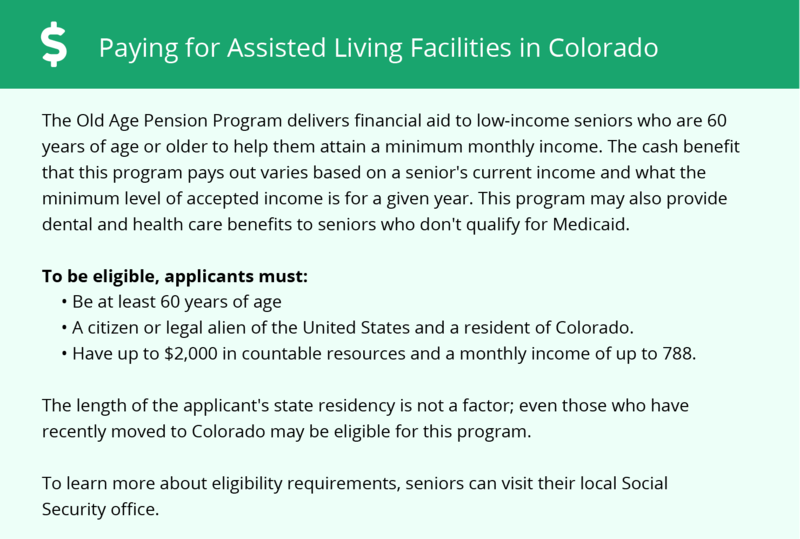 Colorado provides Thornton residents with two waiver programs to support seniors in paying for their care in assisted living facilities: the Supported Living Services Waiver and the Elderly, Blind and Disabled Waiver. To see a list of free assisted living resources in Thornton, please visit our Assisted Living in Colorado page. Thornton-area assisted living communities must adhere to the comprehensive set of state laws and regulations that all assisted living communities in Colorado are required to follow. 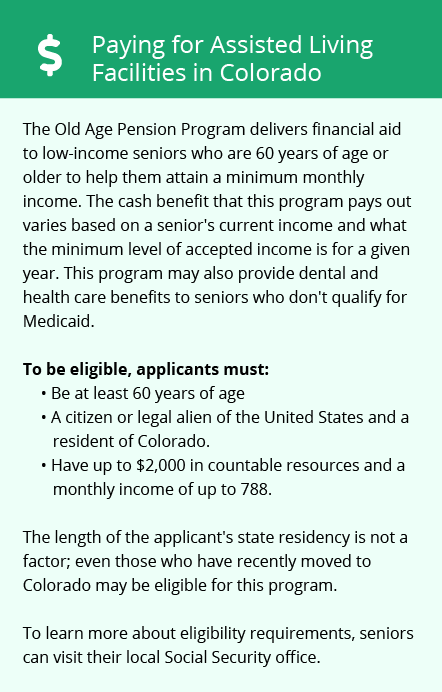 Visit our Assisted Living in Colorado page for more information about these laws.